Kathleen O’Neal, left, and Carol Ritchie, right, with red forehead dots, or Tika, during the Festival of Lights. In 2008, islanders Kathleen O’Neal and Carol Ritchie’s passion for orchids and desire to view some in their natural habitat led them to Indonesia where they toured Borneo’s rain forests and the Danaan Valley, home to some extremely rare and endangered orchids. This marked the beginning of travel adventures to off-the-beaten-path destinations for Kath­leen and Carol. Leav­ing the husbands at home worked well for the men, and so far the women have found many mutual interests and enjoy sharing the tours. The duo has traveled to several continents with an organization called Overseas Travel Adventures (OAT) that focuses on bringing small groups of seasoned travelers into the culture and habitat of the hosting country. Living with a local family, eat­ing native meals, experiencing the everyday life of the country in a very personal manner is a goal for OAT, and one of the rea­sons Kathleen and Carol return to their tours year after year. Destinations since 2008 in­clude visits to Africa touring Bo­tswana, Zambia and Zimbabwe during one tour, then Tanzania and Rwanda on a subsequent trip. They have also toured Pata­gonia, Argentina and Chile. Late last November, Kathleen and Carol traveled to remote Ne­pal in the mystical Himalayas for a 14-day adventure includ­ing a three-night overland trek up mostly vertical terrain in the Annapurna range in the Himala­yas, white water rafting, a jungle safari, and visits to Nepal’s capi­tal, Katmandu and to Pokhara, the second most populated city in Nepal. This trip was planned during the warm season in Nepal be­cause most of the area where they would be traveling was without electricity or other amenities. Their Brahmin guide from Katmandu spoke English and was well-versed in the mostly Hindu culture and life of the communities to be visited. 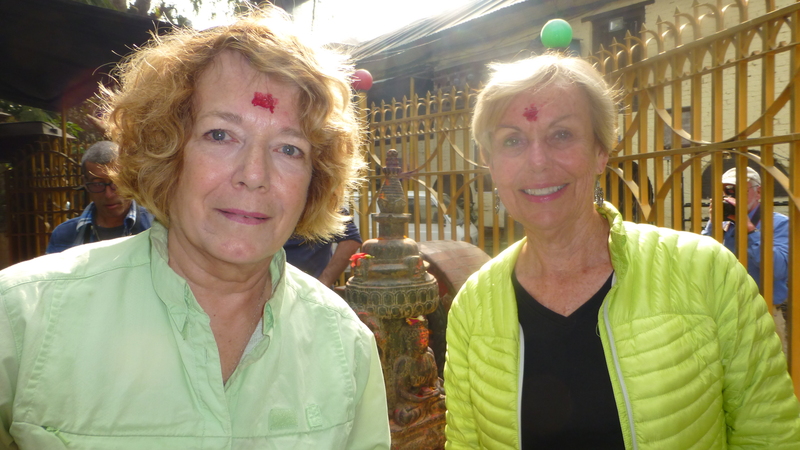 Kath­leen and Carol both commented on the warm hospitality extended to them by the Nepalese people. In one locale they stopped to speak with a family and were spontaneously invited to share their evening meal baked in a clay oven. The generous spirit and willingness to share a meal was not lost on the American women who commented that there is too little of this in our culture. Highlights of their trek included visits to over 40 Hindu shrines and temples and a few Buddhist temples. They participated in the five-day Hindu Festival of Lights, a celebration of life and prosperity. Dur­ing this celebration a red dot, or Tika, was painted on their foreheads. Dancing occurred every night and many people invited them to their homes. They also met Ku­mari, the Virgin Goddess who from the age of three to puberty serves as the incarnation of the goddess Kali and is worshipped by thousands. She rarely appears in public but made a public ap­pearance during this festival. They also witnessed the native practice of public cremation at funeral ghats and the spreading of the deceased ashes into the river. Touring Katmandu, a smoggy city of 3 million, was a little crazy as there were no stop lights or stop signs anywhere. Also noted was the use of bamboo as a primary wood for founda­tions, walls and even scaffolding around buildings. It was a com­mon practice even though struc­turally the bamboo often left a building off kilter and appearing unsafe. The populations they visited were primarily female or chil­dren since the men often traveled to find jobs in other countries only returning home every two or three years. Most Nepalese enjoy a robust and natural health, a result of a life lived close to the earth. Many foods were grown locally in this mostly vegetarian culture, grains were hand ground and hand tools were used in carpentry. Walking miles daily on packed dirt roads was common as paved asphalt does not exist in most of the country. In one area, the local school was one thousand steps up a hill.